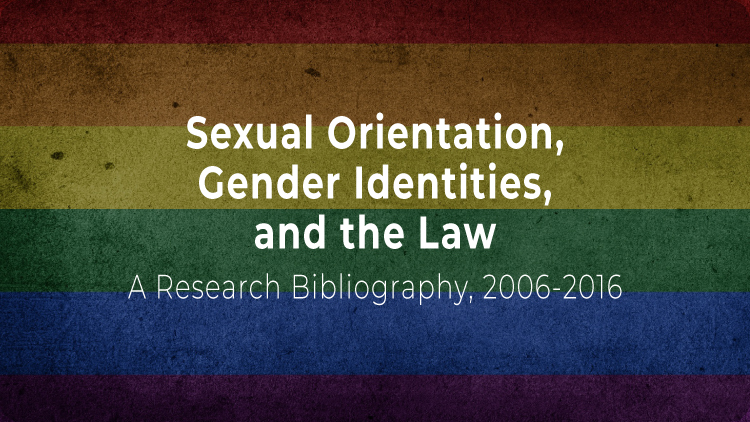 Sexual Orientation, Gender Identities, and the Law: A Research Bibliography, 2006-2016 is the third published iteration of an ongoing commitment by the Standing Committee on Sexual Orientation and Gender Identity. 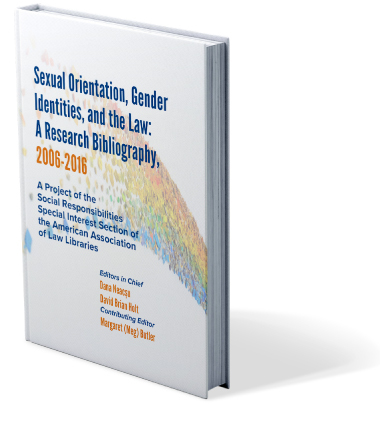 This volume, the only work of its kind, provides a bibliometric analysis of legal scholarship to evaluate scholarly trends, patterns, and the development of major themes and voices. It provides clarity of language incorporating a detailed glossary in the front matter of the volume. The information within this bibliography—the chosen citations, the publication details, the annotations both summary and evaluative—offer more than accurate details about each specific entry: they provide a story with a point of view as well as raw data for future studies that the editors and the contributors could not have anticipated. David Brian Holt, J.D., M.L.I.S., is a Reference Librarian at the University of California, Davis School of Law. Prior to his present position, he was a Branch Librarian with the Ninth Circuit Court of Appeals. He received his JD from Santa Clara University and his MLIS from San Jose State University. In addition to his reference work, he has taught courses on advanced legal research to second and third-year students. He has published scholarship discussing the intellectual freedom of LGBT adolescents and the Children’s Internet Protection Act (CIPA). He has served as Chair of the SR-SIS and is currently President of the Northern California Association of Law Libraries (NOCALL). Dana Neacşu, Ph.D., D.E.A., LL.M., M.L.S., LL.B., is Librarian & Lecturer at Columbia Law School and Adjunct Professor at Barnard College. Dana started her legal career as a civil law judge. Later she moved into academia as an Assistant Professor of Law at Bucharest University School of Law. After spending a year in Israel, volunteering for the peace process, she moved to New York City. She briefly worked for the Open Society Institute where she wrote her first annotated bibliography on the plight of the Roma. Her commitment to social justice causes intensified while she worked as an NYC attorney. In 2000, Dana returned to academia in her current position. In 2017/18, Dana served as Chair of AALL, SR-SIS.